Sometimes, greatness is thrust into your laps. Sometimes it is. Sometimes, some kind soul – @temisol in this case makes a suggestion, sets you on a course of deliciousness that leaves you breathless. The suggestion of adding pumpkin puree to your mix, the fact that it lends sweet and smooth and a touch of peculiar…that, my friends is greatness. I’ve made this twice. 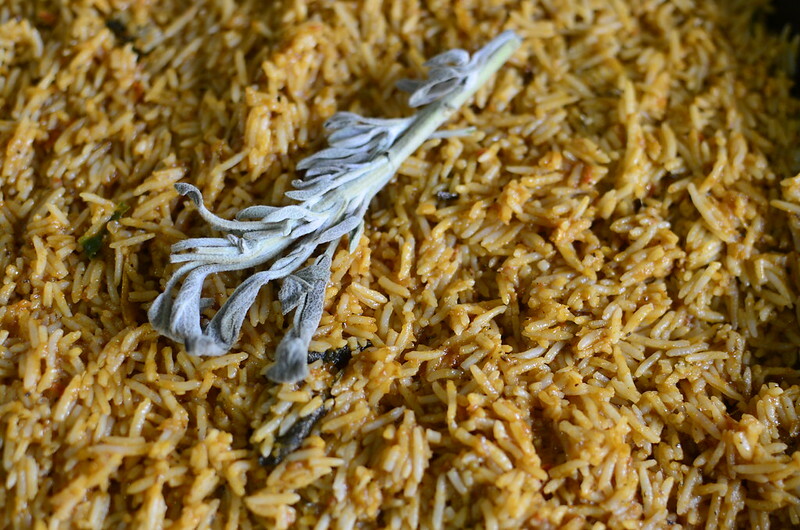 Take 1 was with Egyptian rice which is somewhat short-grained with bite. I oven-baked it and everyone loved it. I thought it was nice and couldn’t wait for Take 2. 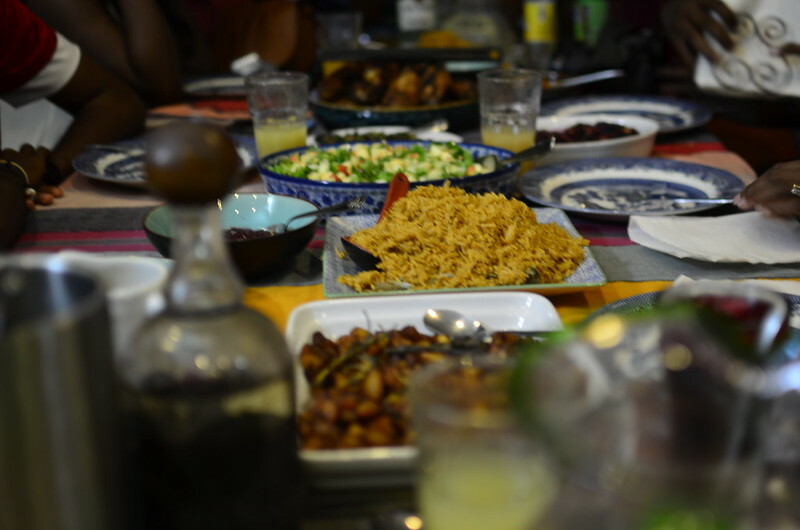 Take 1 was the reason I decided to theme my dinner Nigerian-American. 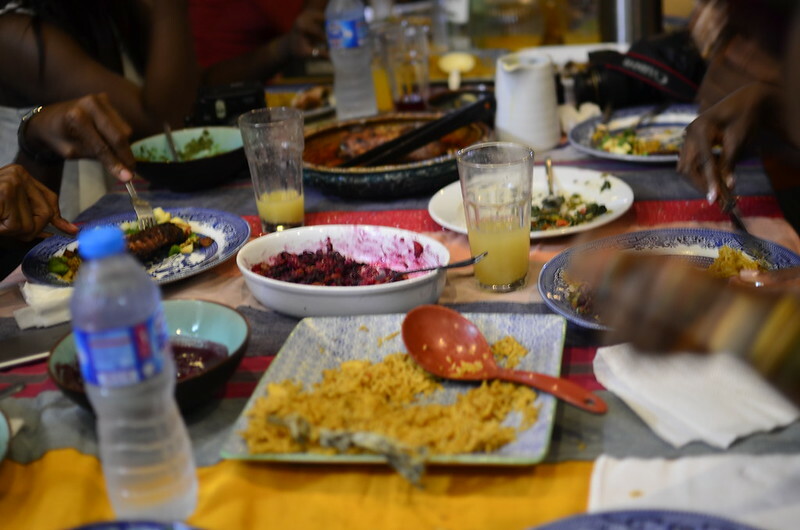 To blend cultures and cuisines. Take 2 worked out even better. And all because earlier on in the week, I stir-fried basmati for lunch boxes and a spark went off in my head. I figured that the best way to retain the pumpkin flavour would be to coat the grains with it via a stir-fry and then finish off with an oven-bake. 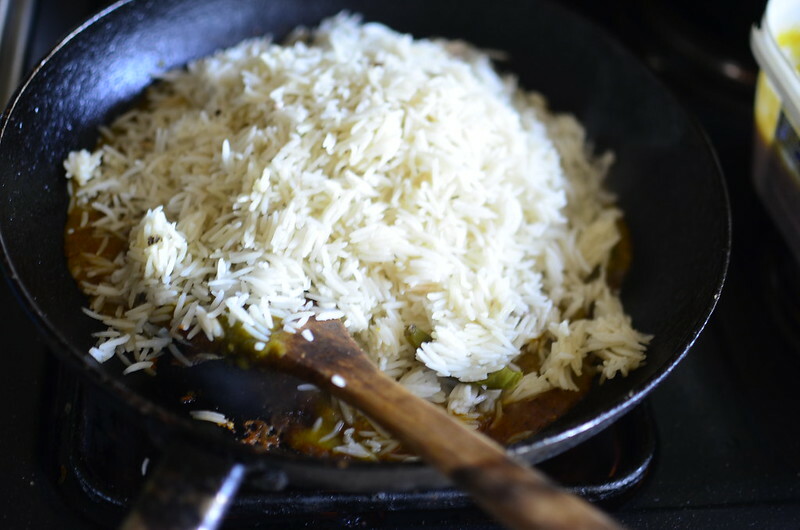 The rice is stir-fried in batches then finished off in the oven so you’ll need a frying pan and a deep oven dish or baking tray. 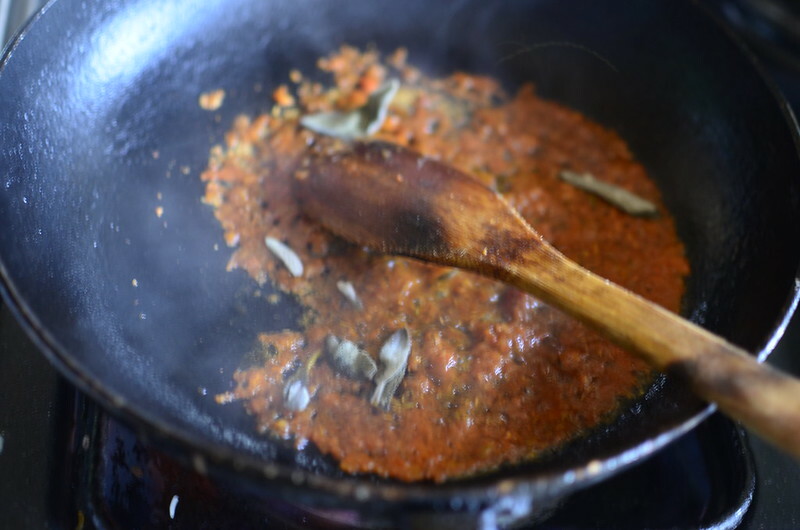 I began with some vegetable oil in the pan, to which I added 1/4 cup of cooked tomato sauce, a teaspoon of tomato puree, curry powder, dried thyme and a few sage leaves. I let this cook for a minute or two, stirring. Be careful here though because the mix splatters so low heat is best. I followed with 2/3 cup of pumpkin sauce and stirred. And let it cook and then I added 3 cups of stock-cooked basmati rice and stirred well, checking and adjusting seasoning. 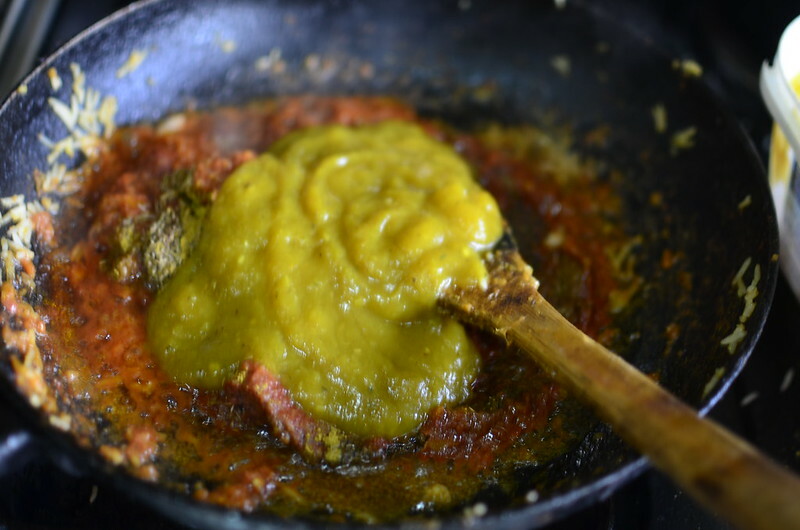 Once the grains are coated with the sauce, let cook for a minute or two and then…tip into the oven dish. Repeat for the rest of the rice. 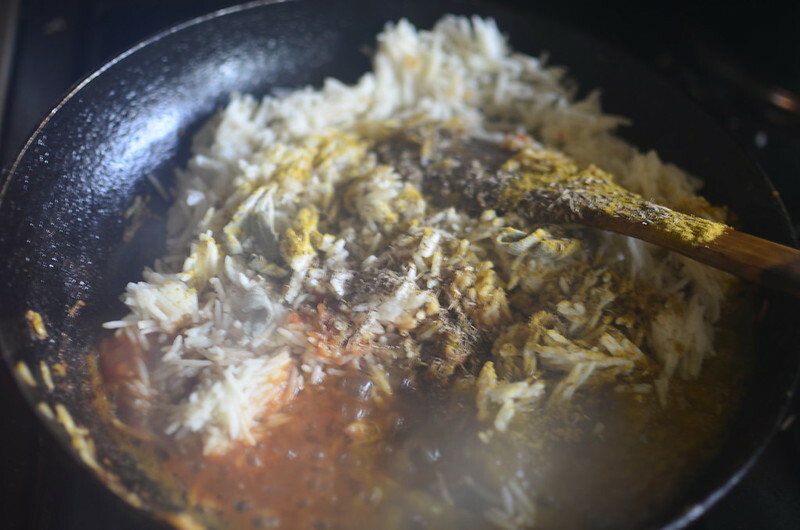 Once you finish, stir the rice so the different batches combine and the flavours are unified. Cover the pan with foil, ensuring all ends are sealed and set in the centre of the oven at 180 degrees centigrade. Let cook for half an hour then check. Gently remove pan from oven. When you open up the foil to check for doneness, be careful as you could get steam burn. 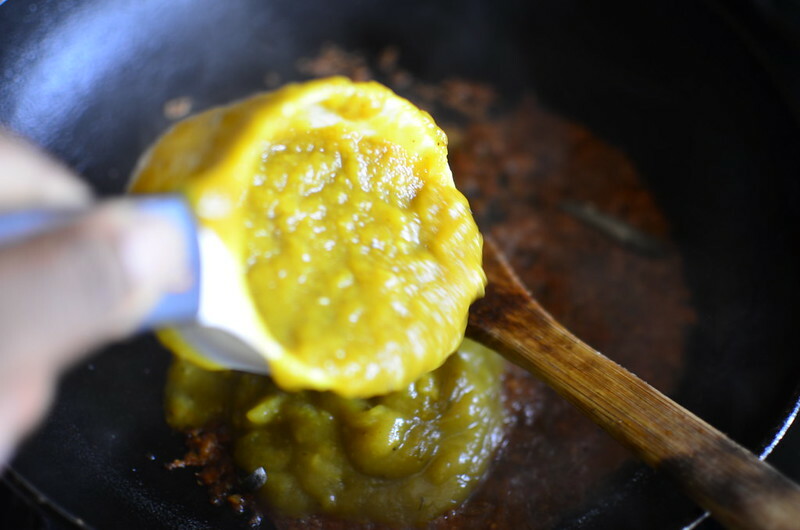 Stir gently, taste and if required, let cook for another 5 – 10 minutes. Remove once set and let rest for a few minutes before serving. Options to accompany? 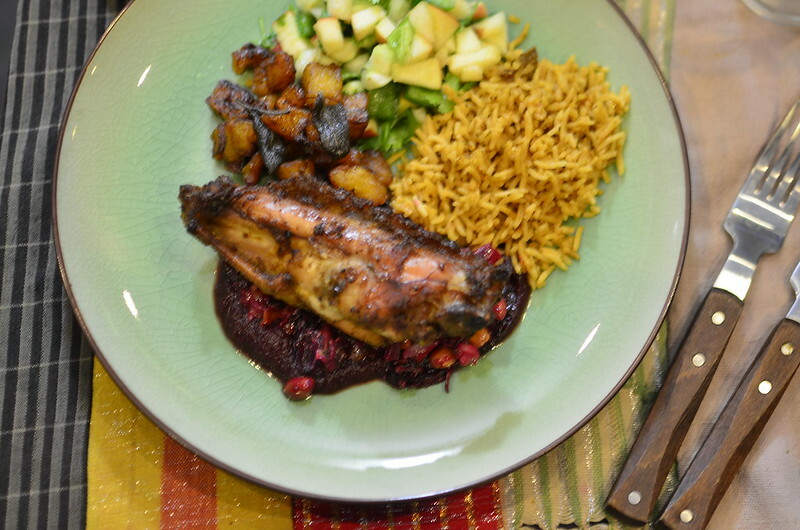 Sage fried plantain, apple salad, turkey wings…and much more. Thank you Temi!